Rob is an associate in the Firm’s Real Estate Group. He concentrates his practice on a wide range of complex commercial real estate transactions, including acquisitions and dispositions, leasing, purchase and sale agreements, and joint ventures. Prior to joining Barack Ferrazzano, he was a real estate associate at Skadden, Arps, Slate, Meagher & Flom LLP. During his time there, Rob represented clients in all facets of real estate transactions and assisted with the structuring, negotiation and documentation of purchase and sale agreements, joint venture documents, security instruments, organizational documents and leases, licenses and other use agreements. 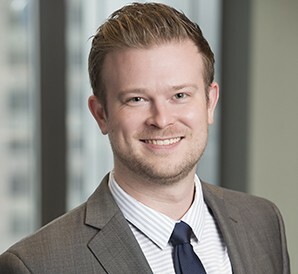 In addition, Rob also has an active pro bono practice and has assisted first-time homebuyers in the purchase of homes through the Chicago Housing Authority's Choose-to-Own program.